In order to create a cross-platform application, it is important to begin with the right tools and the right method - this is not only true for cross-platform development, but for all development. In this article I will explain you how I begin the development of my LiveCode applications with the focus on getting it right across different platforms. Before anything, we have to think about what we want to do. For this tutorial I chose a stack that I made in order to test all my tools, NativeDoc, NativeGeometry and the upcoming NativeSpeak. 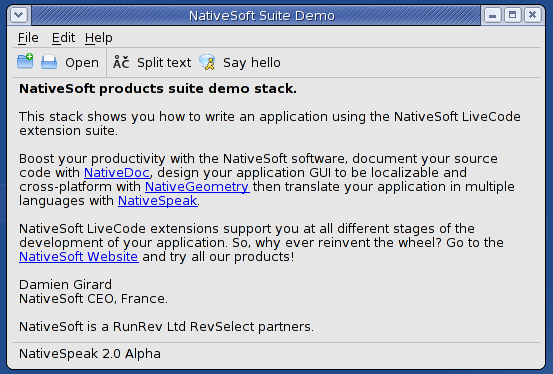 This stack can be downloaded here: http://www.nativesoft.fr/downloads/NativeGeometry/NS_Demo.livecode, but the goal of this tutorial is that you will be able to make it yourself. 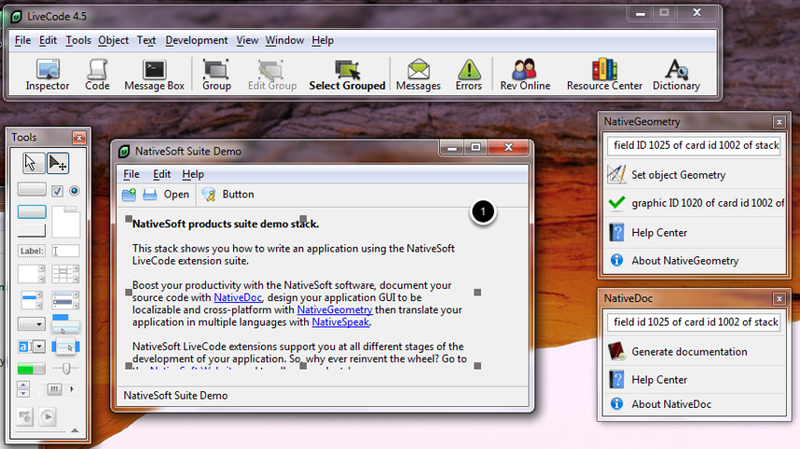 As you see, the application looks like a native application on all platform, only expert eyes can see that it is a LiveCode application on Windows and MacOS X. 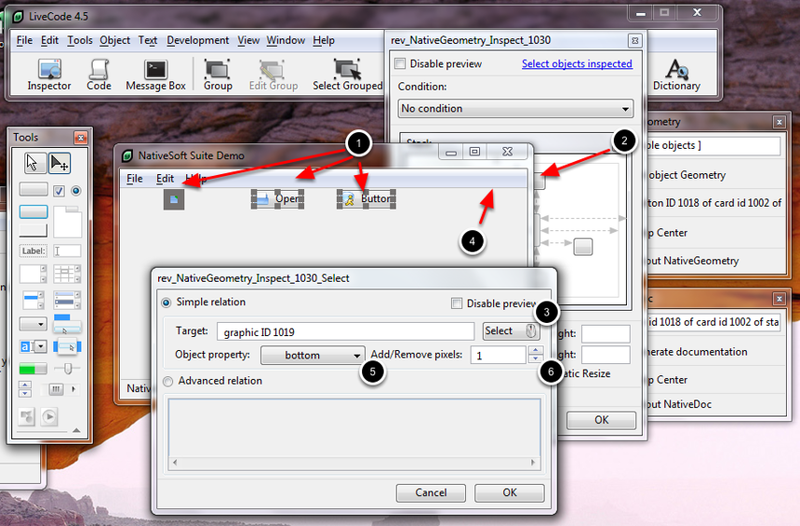 To do this tutorial, you need NativeSoft NativeGeometry. 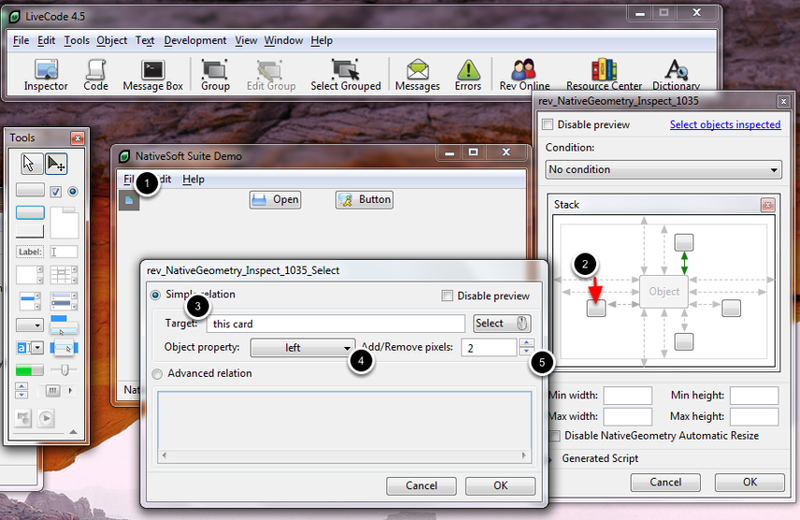 As of version 2.1 NativeGeometry has a new evaluation edition that enables you to try it without any limitations. (There are just some nag screens). 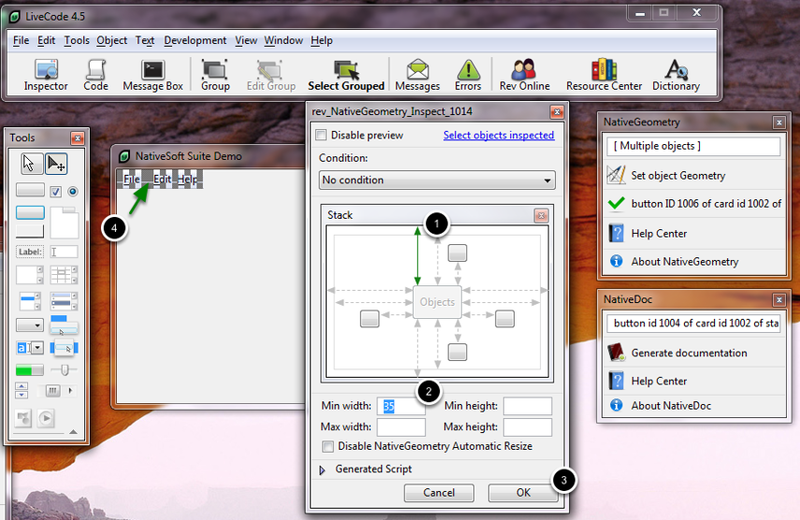 NativeGeometry is a geometry manager for LiveCode. Create a new mainstack "File->New Mainstack". 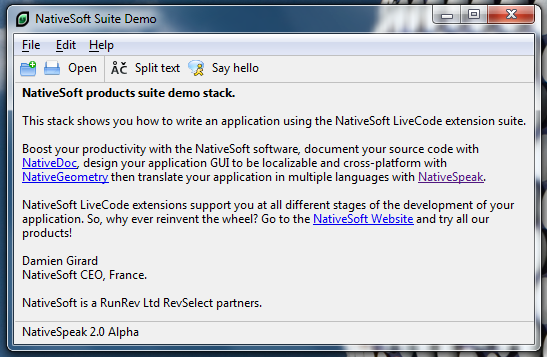 To create the menu, we will not re-invent the wheel, we will use the LiveCode Menu Builder. 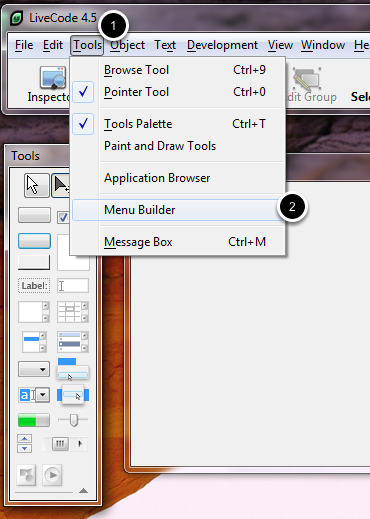 Click "Tools (1) > Menu Builder (2)". In the menu builder, click "New" (1) in order to create a new menubar. Leave the default menu entry and click "OK" (3). 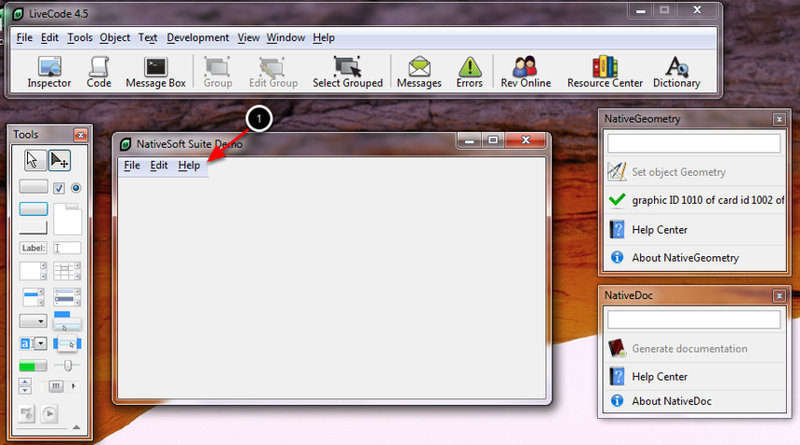 - Check that "Set as stack Menu bar" is activated, then close the menu builder. 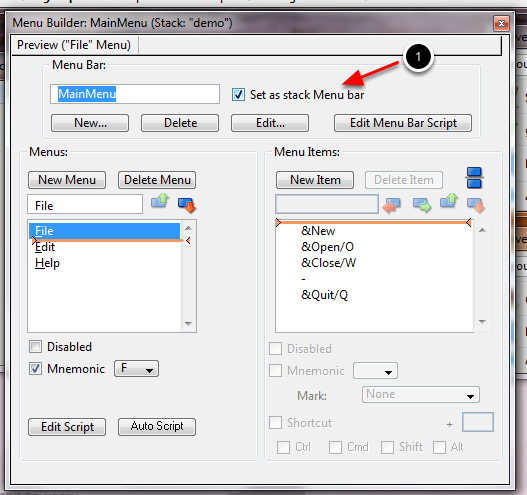 - Check that "Set as stack Menu bar" is not activated, then close the menu builder. 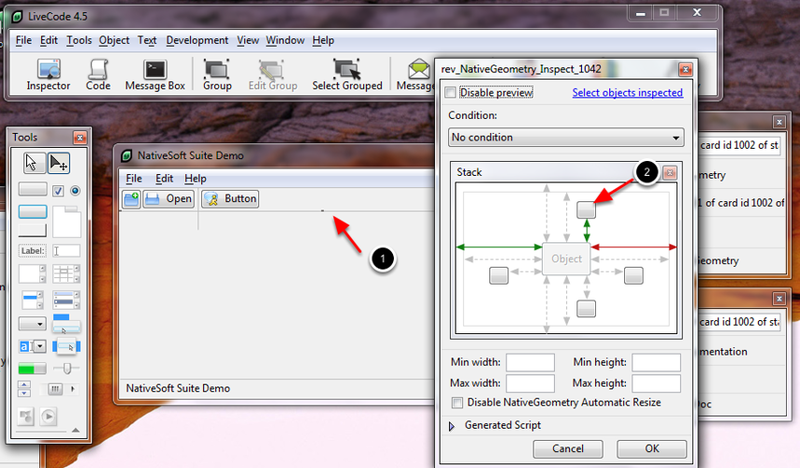 If you activate this option on MacOS X, you will not be able then to set the geometry of the menu for other platforms. The new menubar has been created, but as you see this is not looking aesthetically beautiful. We will use NativeGeometry to solve this problem. 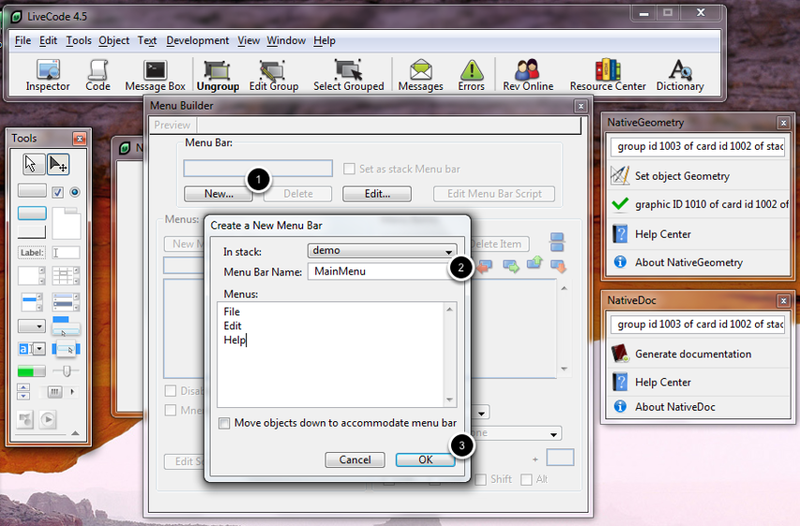 The following operations will set the geometry of the menubar group. 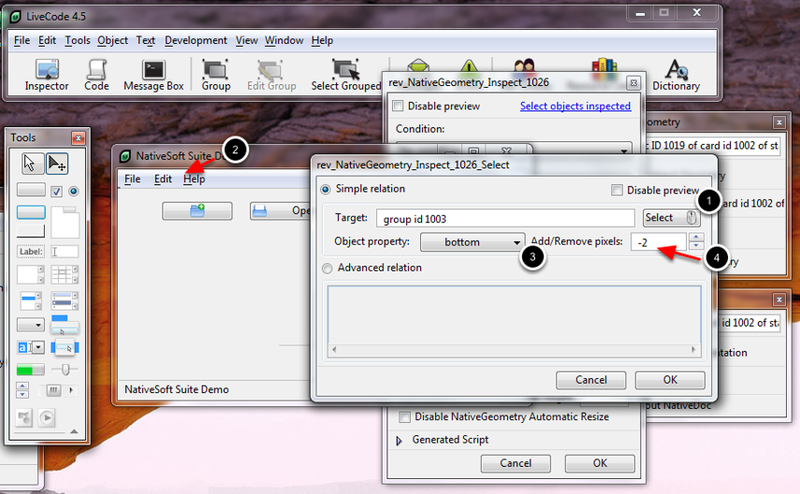 Select the menubar group (1) (be sure that "Select Grouped" is not activated (3)), then click "Set object Geometry" (2) in the NativeGeometry toolbar. 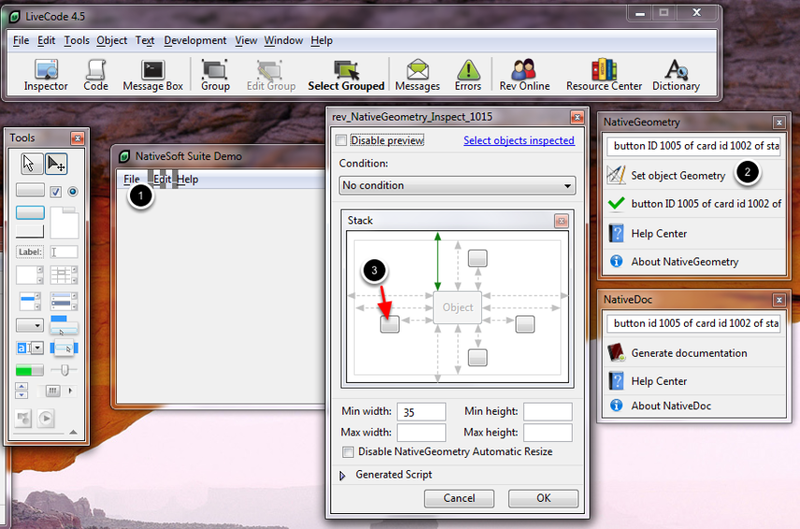 Double click (1), in order to tell to NativeGeometry to resize the right of the object to the right of the stack. 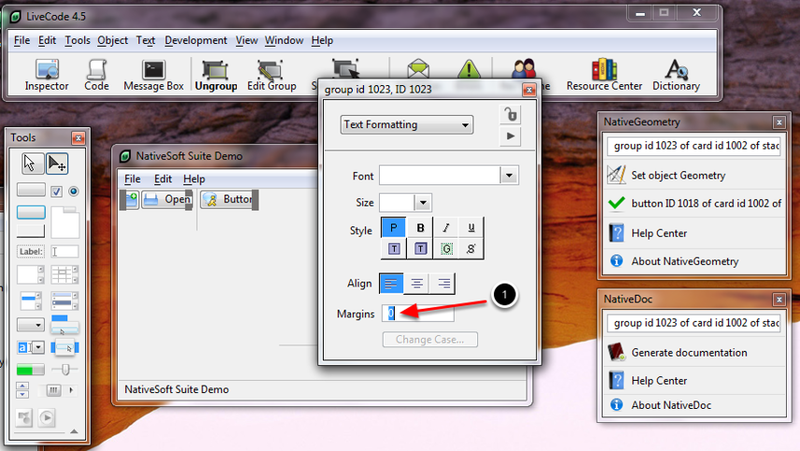 Tips: To make the menu group look far better on Windows, you have to set its margins to "1,0,1,0". The following operations will make the menubar good looking, localizable and cross platform. The idea is to strictly define the geometry of the menubar in order to remove any randomness when switching from one platform to another. So for each element in the menubar we will set its geometry. 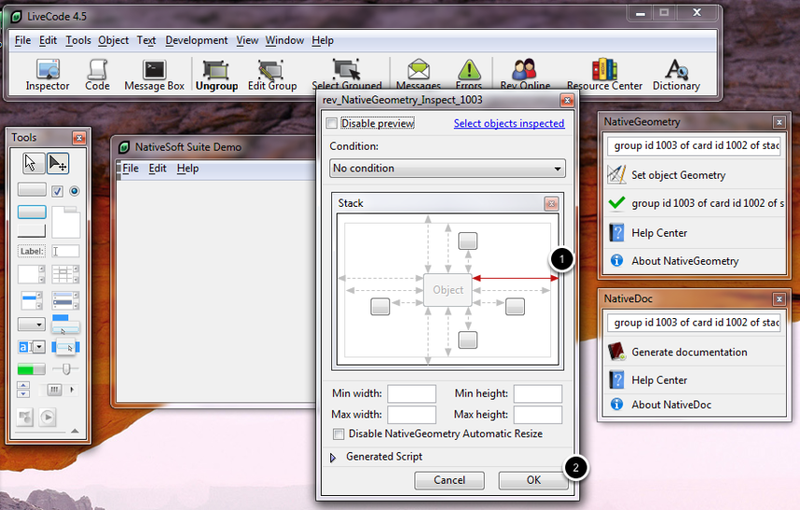 Activate "Select Grouped" (1), and select the button "File", "Edit" and "Help" (2) (hold the shift key to select multiple object), then click "Set object Geometry" (3). Click (1) in order to set the top of previously selected object to the top of this stack. Then set the minimum width of objects to "35" (2). This make the menu more natural. 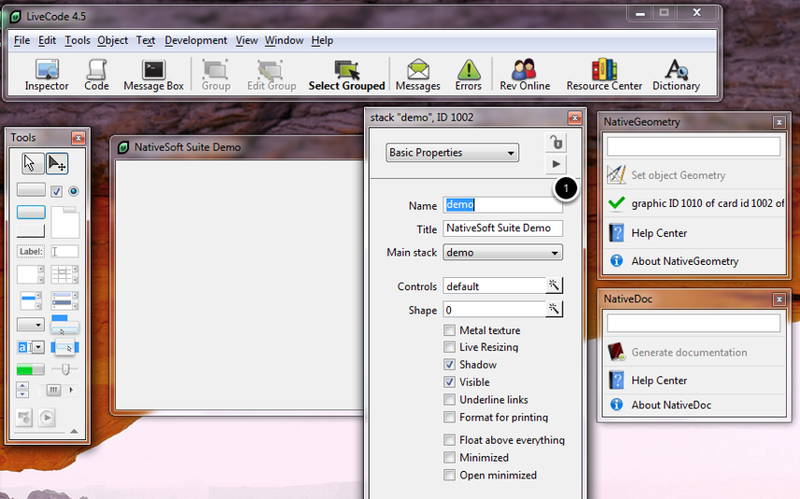 As you see, the size of objects "File", "Edit" and "Help" have changed (4). This is normal, NativeGeometry by default automatically resizes any objects to fit to their best width/height for the current platform! Now select button "File" (1), set its objects geometry (2) then set its left to the left of this stack (3). Save mofications. 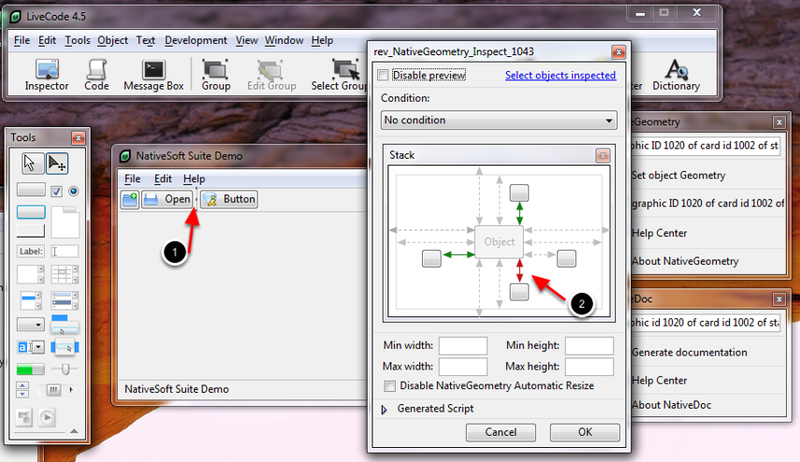 Select the button "Edit" (1), set its objects geometry (2) then click on the button (3). 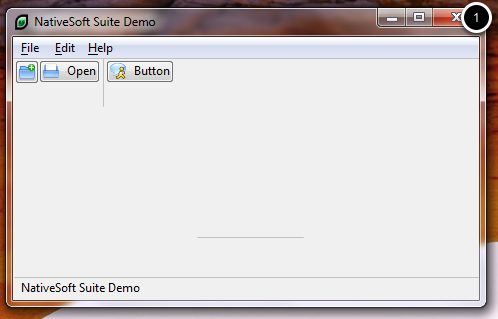 We will set the left of the button "Edit" to the right of the button "File". Click (1) then click the button "File" (2). Now that the object has been selected, you need to choose what property NativeGeometry will use, in our case we want the right. So click (1) and select "Right" (2). Click "OK" and "OK" to save the geometry relations. Repeat the step above, but this time we will do the "Help" button and this button has to be to the right of the "Edit" button. The "hardest" step is now over, if you do all your menus like this, they will be localizable, cross-platform and more. With NativeGeometry, in only few minutes the work is done. Place a line on the stack, set its foregroundcolor to "192,192,192" (1). 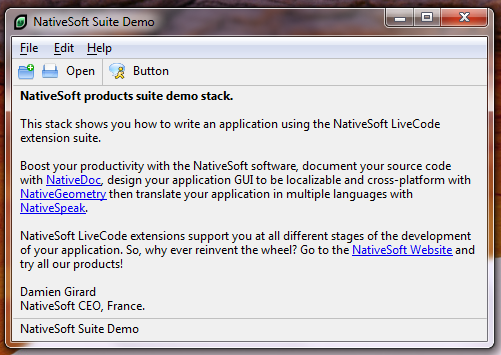 Then, place a label field, set its content to "NativeSoft Suite Demo" (2) or what ever you wish to have displayed. 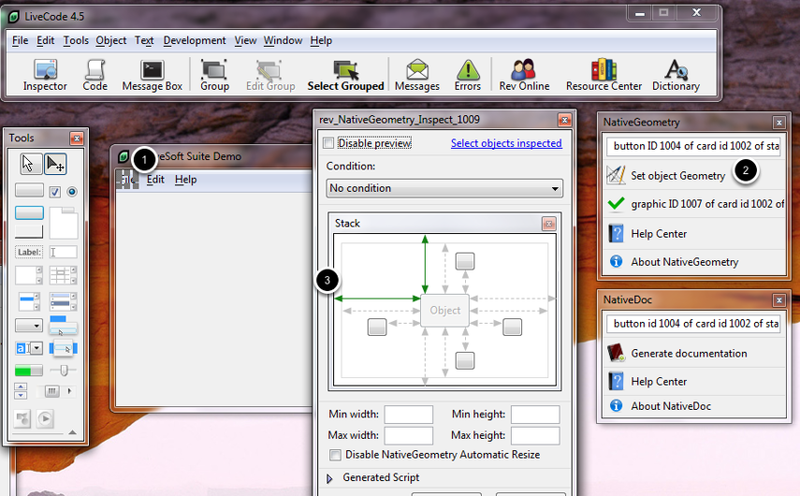 Finally, select the graphic line (1) and click "Set object Geometry" (3). Click (1) to set the left of the graphic to the left of the stack, double click (2) to resize the right of the graphic to the right of the stack and finally click the button (3) to set the bottom of the graphic to the top of status field. Click "Select" (1) and select the status field (2), then set the property to be read (3) to "top" (4). Click "OK" (5) and "OK" to save the relation. 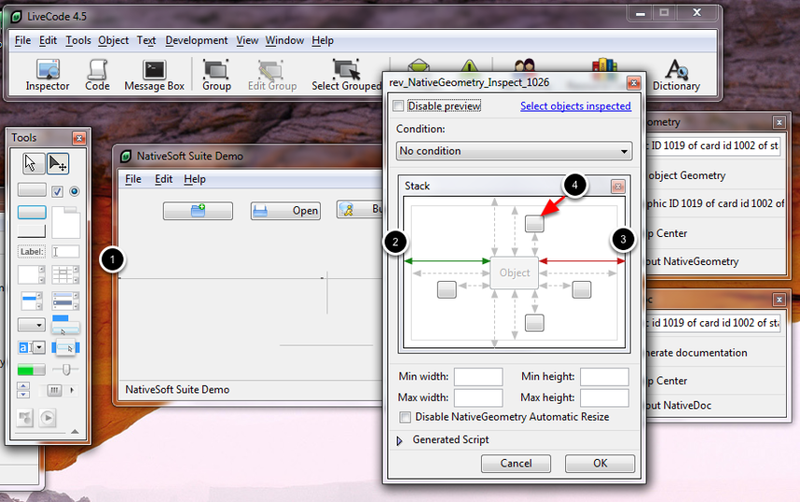 Select the status field (1), set its object geometry (2). Set its left to the left of the stack (3), set its bottom to the bottom of the stack (4) and resize the right of the field to the right of the stack (5). Click "OK" (5) to save the geometry relation. Now we have a menubar and a status bar, next we will attack the toolbar part. Note: From here on I will assume you have understood from the above how to set object geometries with NativeGeometry, so I will skip a few details. If you get lost, please refer to the earlier steps in this tutorial. First, you need to find three icons in 16x16, google is a handy resource to quickly find those. 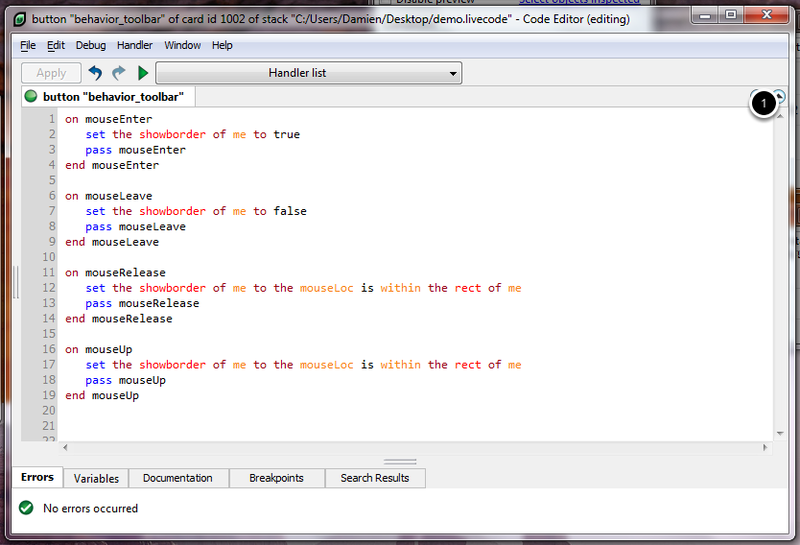 Then, import them into your stack, set them as invisible and create three buttons as you see in the screenshot. - Button (2) and (3) have the textalign set to right. 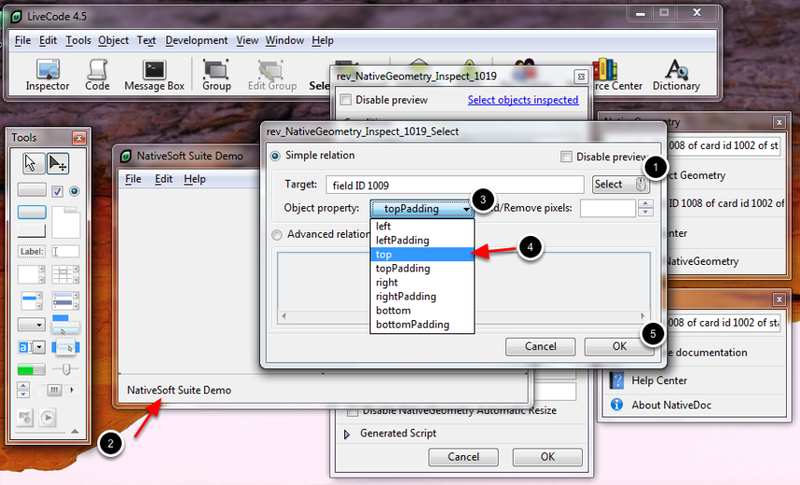 - Do not worry about the buttons' size, NativeGeometry will manage that. Note for MacOS X: Horizontal graphics will be hidden on MacOS X, but on Windows/Linux they must be here in order to have a consistent GUI. (If you look at the first screenshot graphics are hidden on Mac OS X). Select one of the horizontal graphics (1), set its left to the left of the stack (2) and resize the right to the right of the stack (3). Click the button (4) to set the top of the graphic. Select (1) the menubar group (2), and use the bottom property (3) and remove 2 pixels. (4). 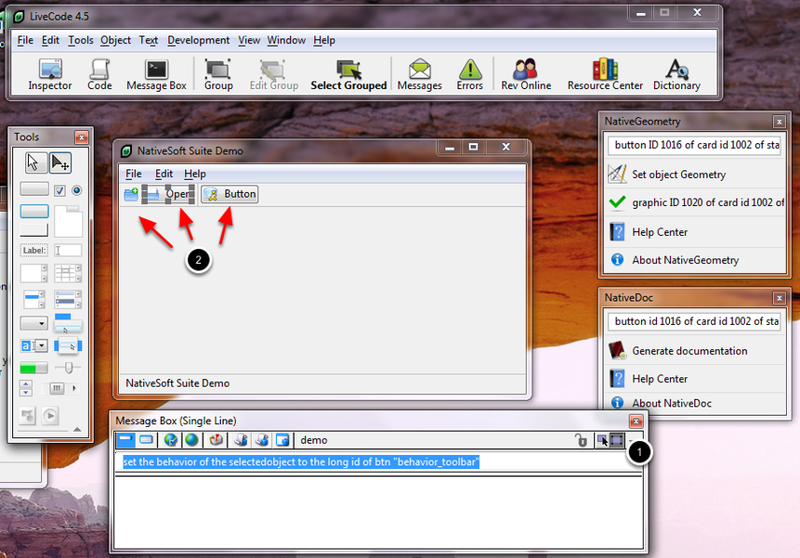 This little tricks make the graphic invisible on Windows Vista/7, but on Linux/Windows XP the graphic will be present. We will set the top of the three buttons to the bottom of the previously set graphic. We will set now the left of the first button to the left of this card + 2. 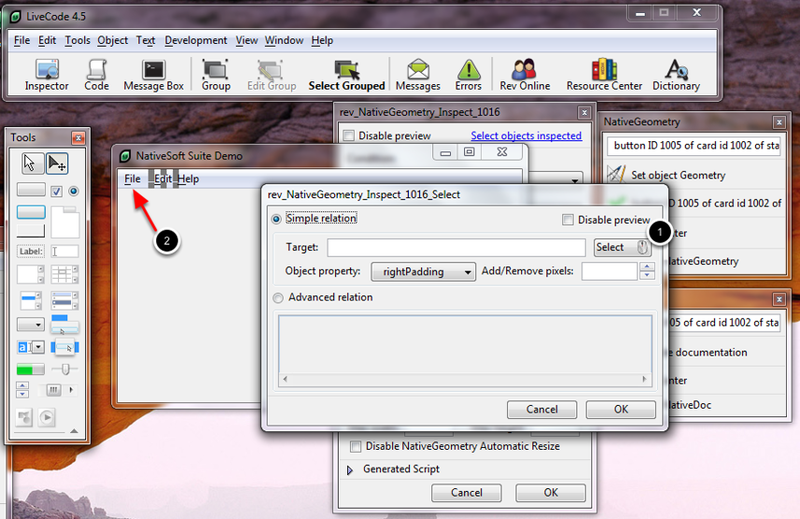 So, select the button (1), then click the button to set the object relative to another one (2) (or an advanced relation). Type "this card" inside the "Target:" field (3), and set the property read to "left" (4) and add 2 pixels. (5). Save the relations, the first button is now set. 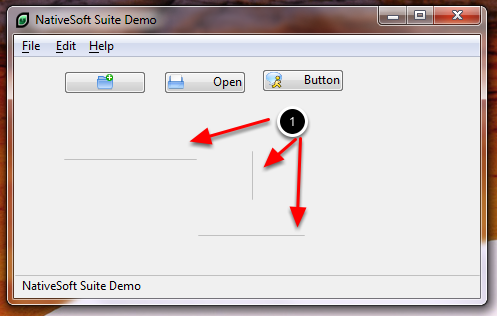 Set the left of button "Open" to the right of the first button. Place the vertical graphic. The left of the vertical graphic should be to the right of button "Open" +2 pixels. Note: Do not set the bottom of the graphic, we will do that later. Set the left of the third button to the right of the vertical graphic +2 pixels. 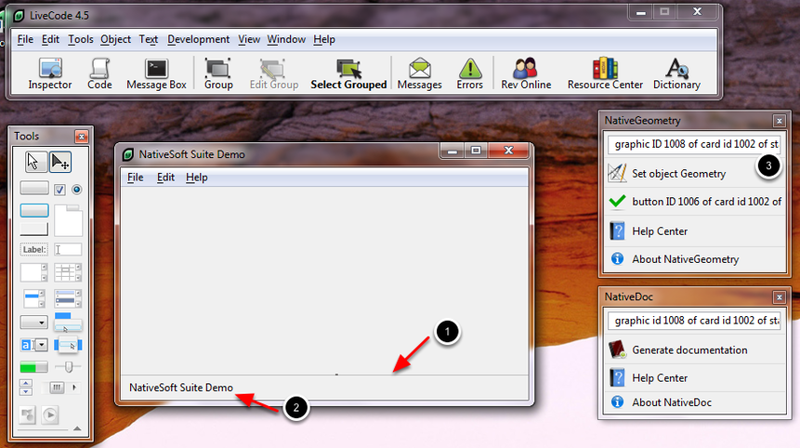 Now, select the three toolbar buttons (1), then group them by clicking (2). Set the margins of the newly created group to "0" (1). 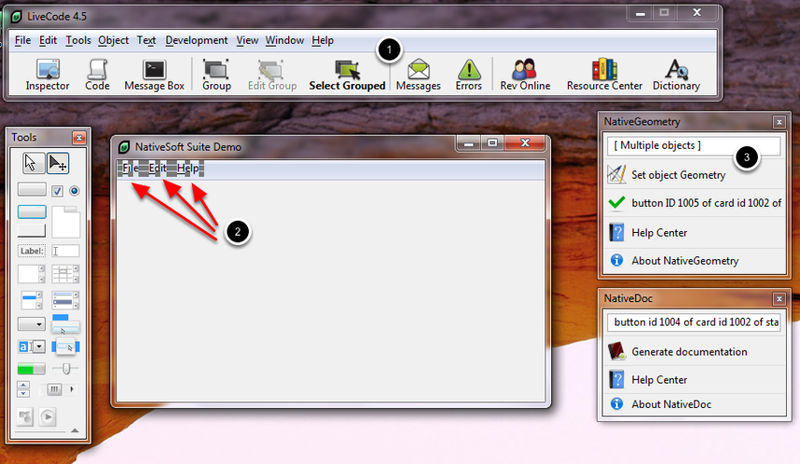 We now have a toolbar designed and you will note that so far we did not have to write any scripts! With just a few clicks we have made a cross-platform interface. RunRev introduced in version 3.5 the "behavior" property. 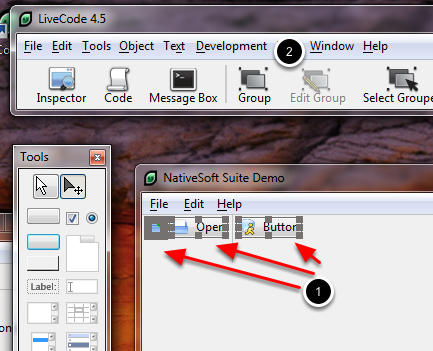 This property enables you to introduce some object oriented programming into LiveCode. 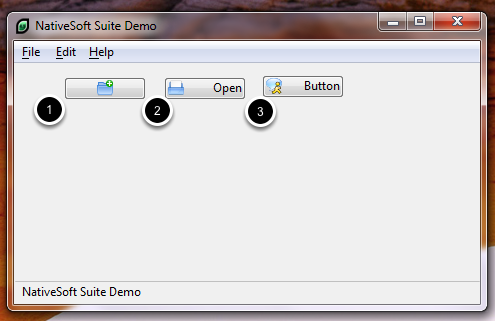 What we want to do is have our buttons in the toolbar show their border when hovered over with the mouse. Instead of copy/pasting the same scripts into all our buttons, we will set an object that contains the script, and our toolbar buttons will "inherit" the script of this object. 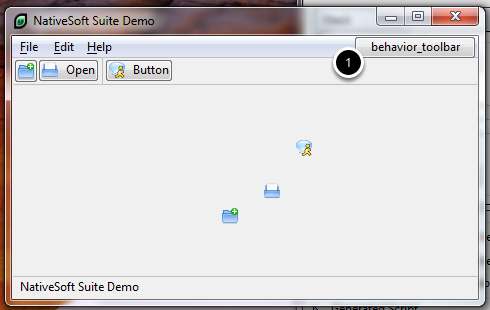 So, create a button, and name it "behavior_toolbar". Now, we will set the bahavior property of our buttons to the newly created button. 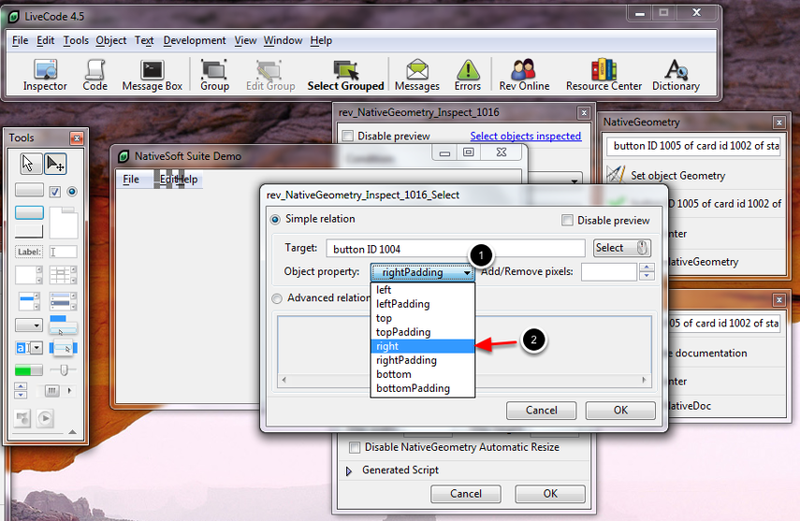 set the behavior of the selectedobject to the long id of btn "behavior_toolbar"
- Select the first button, and launch the command in the message box. - Repeat the operation for other buttons. Now we have a good looking toolbar, the end is near! Place a field on your stack (1) and fill it with some dummy content. 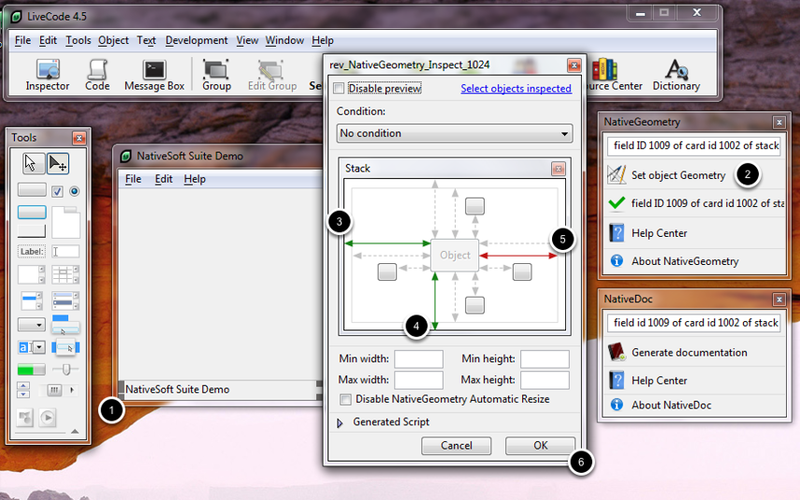 - Set the geometry of the field in order to make it look like the above screenshot. For more explanation about the following script, take a look at the first NativeGeometry tutorial, available in the NativeGeometry Help Center. 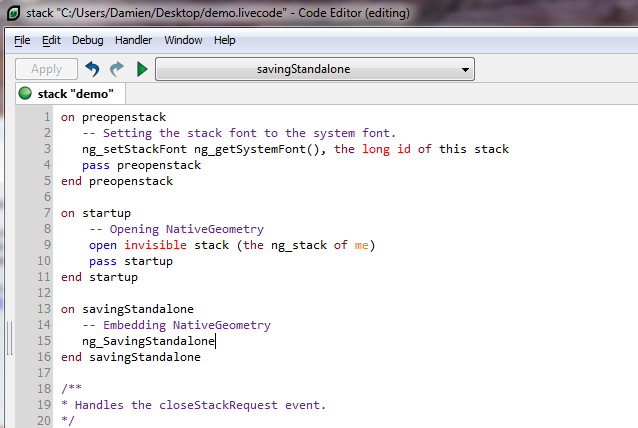 -- Setting the stack font to the system font. * Handles the closeStackRequest event. if the short name of this stack is the short name of me then -- Substack closing protection. On MacOS X, you have to re-activate in the menu builder the property that set "menubar" as "defaultmenubar". Also, on MacOS X you have to hide few graphics, and display a white background to make it look better. 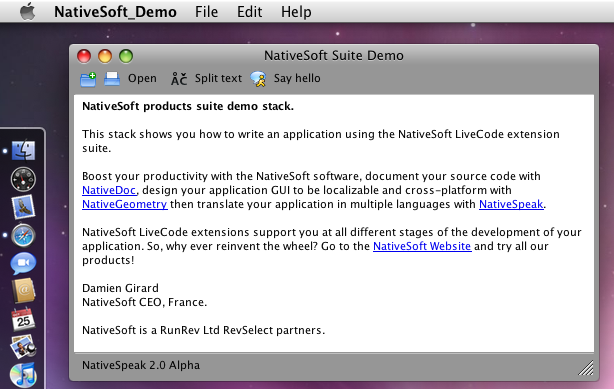 The stack http://www.nativesoft.fr/downloads/NativeGeometry/NS_Demo.livecode contains this script. This is the end of this lesson demonstrating how to write a cross-platform application using NativeGeometry. If you want to discover more in-depth NativeGeometry, I recommend you to check out the two NativeGeometry tutorials located inside the NativeGeometry Help Center. Also, do not forget that NativeGeometry is a library before anything and it has an extensive API! The second tutorial explains how to use it. - Where are the NativeGeometry geometry relations stored? Under the custom property NativeGeometry of the card that owns the object (and the stack for objects placed on multiple cards). 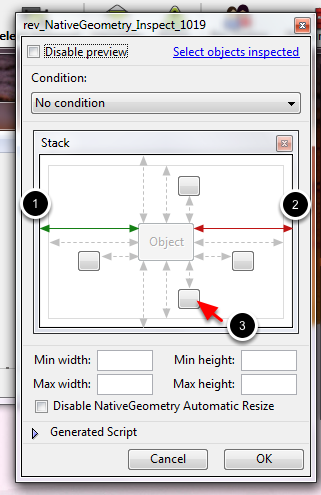 - There is no need to define object resizing order? No, NativeGeometry has an automatic object dependency solver, this solver manages for you all object geometry dependency problems. 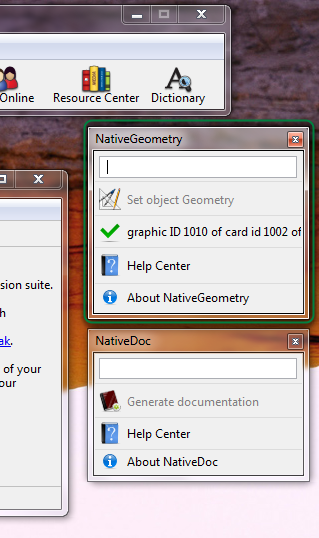 - Can I use NativeGeometry with my existing application? Yes, NativeGeometry can be used within your existing application, just do not forget to pass preOpencard and resizeStack handlers. (or do manual calls to the NativeGeometry engine).